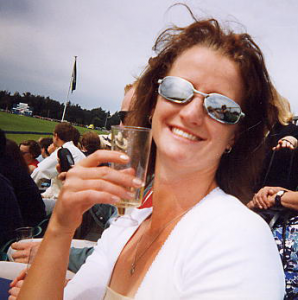 Cassie Templeman (nee Lynas) played for the Northern Polocrosse Club from 1991-1997. Cassie played in the State Junior team at the Forbes, New South Wales National Championships in 1992. She also played for the Intermediate Open team in 1996 at Werribee, Victoria, where she was the only female in the open division. Cassie played in winning A-grade State Championship teams from 1993-1996 riding “Shannon”. Shannon is still alive and retired at age 33. She also played in the State Championship winning B-grade team in 1997 on “Willow”. In 1997, aged 19, Cassie moved to the UK to further her career with horses. She has trained polo horses in the UK and New Zealand. Now residing in Victoria, Cassie works for East Coast Horse Transport. Not many women play polo in Australia, still less play in a winning Australian team, (defeating England in the final) with one of Cassie’s horses winning the champion horse of the tournament. The “gold cup” is the polo championship of the U.K. Here is Cassie drinking “champers” and watching one of her horses play. John Lynas has been involved with horses all his life. His parents had horses and John rode a pony several miles to school from the age of 5 — in those days the schools provided a paddock to hold the ponies during the day. He Rode and trained various ponies for children in the area where he lived . He competed in show jumping and general hack classes in local shows around Victoria. 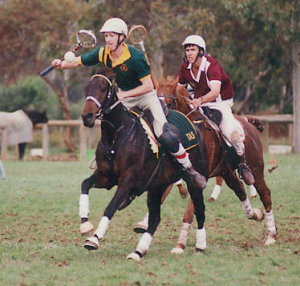 From the age of 12 he played Polocrosse for about 5 years — then restarted playing in Tasmania in about 1988. His family were the main motivators to get Polocrosse started in southern Tasmania. Johns philosophy on loading and transporting horses, is that calmness and the time taken to load that nervous horse for the first time is of the utmost importance! “We may have that foal, easy load or nervous horse for 4 days so we like all horses to walk off and onto the truck with TRUST in us, each day, until we deliver that horse to its destination” John said. John now lives in Queensland and works for East Coast Horse Transport. Kris Lynas began his polocrosse career at the age of 12 on a small pony that bucked a lot. Played juniors for Tasmania at the Launceston National Championships in 1990, the Australian Zone Championships in Bairnsdale, 1991 and in the Forbes National Chmapionships in 1992. Also played under-21’s for Tasmania at the Werribee Nationals in Victoria, 1996. Kris is the only member of the Northern Club to play in all 6 A-grade State Championship winning teams from 1993 to 1998. Kris always plays number 1 because he cannot or will not pass the ball. A multiple best and fairest winner, culminating in the 1998 & 1999 A-grade best & fairests for the year for Tassie. Kris lived in Japan for four years and speaks fluent Japenese, he played polocrosse in Darwin and now plays in Queensland for the Warwick Club. Kris played in the Barastoc competition for Queensland and has played for Queensland in the national competition.